Sundance, Utah. A couple driving through the dark woods spotted something bizarre just a few feet from the road. They manage to turn back around and capture something strange via a cellphone or camcorder. We go to YouTube user ParaBreakDown for a more in depth look at the strange video. Something big definitely is seen standing between the trees. Something that looks to be bipedal at first glance. Of course bears have been known to stand, or walk, on their hind legs for an extended amount of time. Could this video show just that? 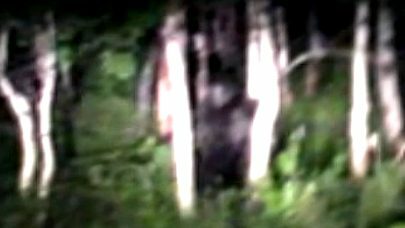 An upright bear near the road at night?